Jacksonville plated three runs in the top of the ninth inning to complete a five-game sweep and come-from-behind victory as the Suns topped Tennessee 6-5 in the Smokies' home regular season finale by a score of 6-5 on Tuesday evening at Smokies Stadium. The defeat marked the Smokies' sixth consecutive loss and dropped the club's second half record to 32-33 in the second half, while the Suns improved to 40-25 since the midpoint of the season. The home sweep marked the first time Tennessee had been defeated in all five games of a series at Smokies Stadium since May 10-14, 2008 by the Huntsville Stars. With an announced crowd of 3,816, the Smokies finished the 2014 regular season home slate by welcoming a total of 283,038 fans, the highest mark in the franchise's history, topping 2002's tally of 268,033. Tennessee averaged 4,102 guests throughout the campaign, which marked the first time in team history the club's average attendance was above the 4,000 mark. Entering the top of the ninth down two, Jacksonville LF Brady Shoemaker walked and RF Joe Benson was hit by a pitch, before both were brought home on 3B Terrence Dayleg's two-run double to left, with Dayleg advancing to third on an error, to even the game at 5-5. Dayleg would then come across as the winning run when SS Danny Black reached base on an infield single, giving the Suns a 6-5 advantage. Once again it was the Suns who got ahead first, this time courtesy of Shoemaker's two-run shot in the fourth. After 1B Viosergy Rosa was hit by a pitch, the infielder came home when Shoemaker slammed his tenth homer of the season over the left-center field fence to push Jacksonville ahead 2-0. Tennessee would then cut down that deficit in half in the bottom half of the frame. 1B Lars Anderson smashed a leadoff double down the right field line, and then advanced to third on a flyout, before coming across on C Charlie Cutler's run-scoring two-bagger to the opposite field in left to make it 2-1. The Suns and Smokies would then trade single tallies in the fifth inning, keeping the margin at one. Jacksonville 2B Austin Barnes blasted his 11tth homer of the season with a solo shot to left, while Smokies SS Anthony Giansanti led off the last of the frame with a single, before eventually scoring on CF Albert Almora's RBI triple down the right field line. The home team would then grab their first lead of the series since Saturday with a two-run sixth. 2B Christian Villanueva began the rally with a free pass, took second on a single and third when RF Rub Silva reached on a forceout, before coming across on 3B Dustin Geiger's RBI single into center to draw the contest even. Silva subsequently scored via Giansanti's sacrifice fly to center to make it 4-3. The Smokies then added on in the seventh with another single tally. Almora doubled down the left field line, before coming plateward via Villanueva's run-scoring base knock to center, pushing Tennessee to a two-run lead advantage. Almora (2-5, 1 R, 1 2B, 1 3B, 1 RBI), Cutler (2-3, 1 2B, 1 RBI) and Giansanti (2-3, 1 R, 1 2B, 1 RBI) all recorded two base knocks in the contest to pace the Smokies offense, while Galloway (2-4, 1 R, 2 RBI) was the lone Suns batter to tally a multi-hit effort. The multi-hit effort was the sixth in a span of 13 games for Almora, during which the 20-year-old has collected at least one hit in all but three of those matchups. Smokies starter Pierce Johnson (6.0 IP, 5 H, 3 R, 3 ER, 2 BB, 3 SO) did not factor in the decision despite a quality start, yielding three earned runs on five hits in six innings of work, while closer Frank Batista (1.0 IP, 2 H, 3 R, 2 ER, 2 BB, 1 SO) suffered the blown save and defeat to fall to 4-3. Jacksonville relief man Nick Wittgren (1.0 IP, 1 H, 2 SO) earned the win with a scoreless eighth, and righty Matt Ramsey (0.2 IP) notched his second save in as many nights, as well as his 14th save overall in 2014. Suns starter Trevor Williams (5.1 IP, 8 H, 4 R, 4 ER, 2 BB, 2 SO) did not factor in the decision after relinquishing four earned runs on eight hits in 5.1 frames. 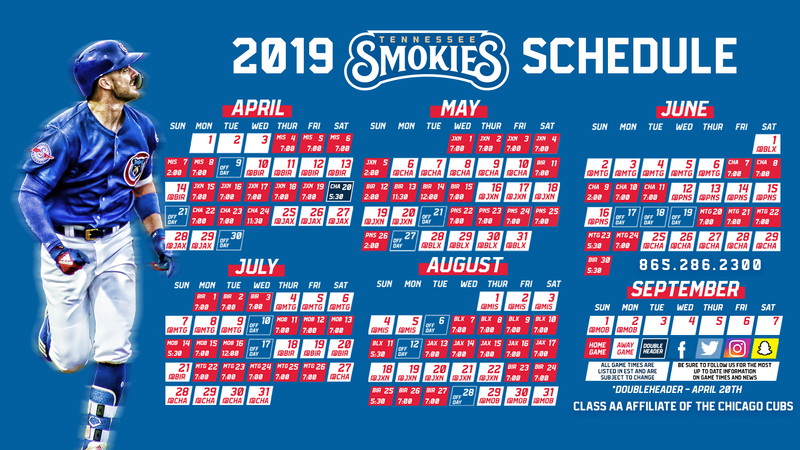 Following an off day on Wednesday, the Smokies will travel to Chattanooga to close out their regular season slate with a five-game series against the Chattanooga Lookouts, the Double-A affiliate of the Los Angeles Dodgers. First pitch of the series is scheduled for 7:15 p.m. at AT&T Field in Chattanooga, Tennessee. Tennessee is anticipated to give the nod to RHP Felix Pena (2-3, 8.74) in the series opener, while the Lookouts are slated to give the ball to RHP Andres Santiago (5-8, 4.80).